1. Sift the confectioners´ sugar, ground almond and green tea powder twice, into a medium bowl. The mixture should be dry and clump together only slightly. If the ground almond is too moist, bake in an oven at 140°C for 5-10 minutes before adding the sugar and green tea powder. 2. Beat the egg whites in the clean dry bowl of a stand mixer until they hold soft peaks. Gradually and slowly add the granulated sugar and beat until the mixture holds stiff peaks. 3. Add 1/4 of the almond flour mixture into the meringue and fold in hard and fast to expel some of the air in the whipped egg whites. Then add the next quarter do the same; then the third and finally the last batch. At first the ingredients will not mix well, but it comes together quickly. Fold more slowly and gently as you continue until you get the consistency of very cold honey. When small peaks dissolve to a flat surface, stop mixing.The final batter is pale and smooth, with no visible aeration. To test the batter, place a tablespoon of the batter in a thin line on the remaining batter. It should disappear in 30 seconds. If not, do a couple more folds. 4. Spoon the mixture into a pastry bag fitted with a plain 1.25cm (half-inch) tip. Pipe 2.5cm (1in) mounds of batter onto a baking sheet lined with nonstick liners (or parchment paper) on a baking tray. Dab each corner of the baking paper with some batter so that it does not slip. Pipe vertically over the centre, about 5mm above the surface. Tap the underside of the baking sheet to remove air bubbles. Air-dry macarons until they are dry to the touch (usually about one hour, but it can take up to four hours). 5. Preheat oven to 200°C. Put macaron tray in the middle shelf, and immediately turn down temperature to 160°C. Bake for eight minutes, rotating tray and baking a further five minutes. They are ready if a macaron shell moves “reluctantly” off its position when you lightly nudge it with a finger. 7. Turn off oven and leave the tray in the oven for 10 minutes. Remove macarons and cool on a rack face up before filling. 8. 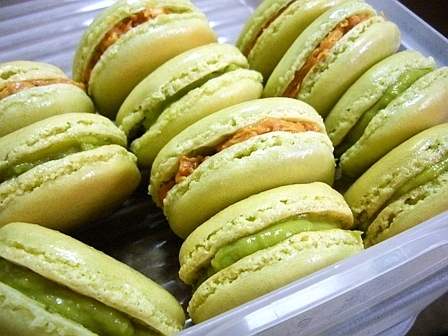 Pair macarons of similar size, and pipe about 1/2 teaspoon of the green tea filling onto one of the macarons. Sandwich with its “other half”, and refrigerate to allow flavours to blend together. Bring back to room temperature before serving. To store: Place in airtight containers and refrigerate. 1. In a medium bowl, whisk together yolks and a third of the sugar until thick and pale. Add in flour, custard powder and green tea powder. Whisk until well combined. 2. In a saucepan, boil the milk with the remaining sugar. Once it boils, stir in vanilla and pour onto the egg yolk mixture. Mix well. Pour mixture back into the saucepan and return to the stove. 3. Over a very small flame, bring to a boil, stirring continuously with a whisk. Let it simmer for two minutes, stirring. Strain the custard into a bowl. Immediately place bowl into an ice water bath and stir until custard cools. To store: place some cling film over the surface of the custard to prevent a skin from forming, and refrigerate.